Summer Activity Club For Kids At Jubilee Hills is an event that took place between 14-Apr-2008 and 30-Apr-2008 in Hyderabad. 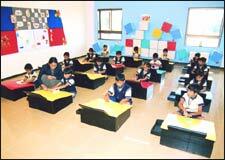 Vibgyor is a special summer activity club for kids in the age group of 3 to 6 years, being held at Road No. 2, Banjara Hills, from 14th to 30th April, between 5pm and 6:30pm. There will be a wide range of activities, from meditation, yoga, karate and physical fitness to craft, culinary art, song, dance, story appreciation, painting, gift-wrapping, team building and theme-based games. The teachers who are going to teach this little kids are Neha (who is also the organiser of this camp), Palak and Purba. Vibgyor is the name of the summer camp, and is being conducting with the help of the Bangalore-based company Active Kid. Neha is going to take only 15 kids for the camp, and is also calling artists to teach dance and music. The fee for the entire camp is Rs 1,350. Please contact Neha on 97018-14052 for further details. Be the first to comment on Summer Activity Club For Kids At Jubilee Hills! Just use the simple form below. fullhyd.com has 700,000+ monthly visits. Tell Hyderabad what you feel about Summer Activity Club For Kids At Jubilee Hills!